Employee benefit plan is offered by employers to their employees in order to ensure that employees are motivated to work for them. Law does not have any compulsion on the employers to provide specific employees benefits. Most of the organization does that for their own reasons and employees are always happy to receive such benefits. Employee benefit plan was once a forte of large organizations that could turn such type of money in. Things have changed way too much, every organization nowadays common employee benefits like medical, disability, and Health insurance, bonus, retirement benefits offers similar benefits to the employees to attract them and retain them with the organization. What are Employee Benefits Package Offered? Employee benefits examples are perks, fringe benefits or perquisites that are offered to various employees in addition to their normal wages and salaries. There are many such benefits that are offered to employees, each organization design their own benefit plan keeping in mind the employees demands , companies paying capacity, current requirements, law obligations and overall benefits. The better the health care benefits are, the happier the work force would be. Health care employee benefits plan is advantageous for both big and small organizations that care for their employees. A survey states that 61% of the employees in USA are satisfied with their organization that provides them healthcare benefits. The plans that are covered here are many, organization can choose from group insurance which is cost effective, individual health plans and family care plans. The idea here is to ensure that the need is fulfilled. Highly suitable way here is to provide the flexibility to the employees. Various companies have a premium reimbursement policy which has a ceiling, here the employees are allowed to choose insurance they feel suitable for them and the organization pays for the premium. This saves time of the organization as they do not have to invest in finding the suitable insurance plan and also makes the employees happy as they have the decision making power. Health care plans also ensure a healthy working environment and government also encourages employers to provide this benefit to its employees. This benefit plan allows employee to stay loyal to the organization. Retirement benefit plans provides employees a satisfaction and relaxation that they will have security when they retire, this leads to sustained workforce and a comfortable working environment. There are definitely programs such as social security that exits, but it is seen that employees greatly value additional retirement plans. Most employees are well aware of saving benefits but unfortunately miss out on planning a monthly saving plan. When they realize it is late and might even lead to stress and decrease in work efficiency. Then the employer’s makes initiative and companies offer such retirement benefit plans, the employees actively participate in them and take the necessary steps. A plan that qualifies certain government requirements is tax deductable. It has various tax benefits for both the employee and the employer. The earnings and contributions are tax-free until withdrawn and when these are transferred to retirement plans offered by government, even they become tax-free. It is advised to check for the tax benefits here to choose the best suitable plan. Employees are often seen taxing over schedules and flexibility in the workplace. A situation when an employee has to take time off without getting paid for it is a very uncomfortable situation, there are times when it can be financially straining. If employees go through such situations often it is both physically and mentally draining and it shows a direct affect on the health and efficiency of the employees. Thus, it is often seen that flexible pay and work option are regarded significantly dear to the employees. Flexibility also allow employees to cover for their outstanding projects later so that no work is lost for the company. Another trending benefit plan that companies now a day benefit the employees with is wellness programs. These programs focus on improving the overall health of the employees in an organization. This could include Gym facilities, stress management classes, smoking cessation, exercise classes, yoga centers etc. This also covers for better time management when these facilities are available right in the office premises and keeps the employees happy. Wellness programs have shown a drastic impact on the overall productivity and efficiency of the employees. Longer duration has shown that investment in wellness programs have shown a great returns and companies expand the number of such facilities who are able to tap the benefits. Employees are often seen interested in improving their skills and growing with the passing of time. Work and self-improvement balance is regarding high amongst most employees. Most organizations are seen supporting employees with their education plans or skill development classes especially when they are eventually going to benefit from it. Employee development leads to employee retention and it is also an integral part of creating a positive and growth related culture in an organization. Most employees appreciate employers for funding their higher education. Benefits for employers with highly qualified and skilled staff who is loyal to the organization, which is a win-win situation for all. There are many organizations who take care of employees mental and psychological development also. This plan may range from providing support to counseling for employees who might show the need. This can be general counseling to professional skilled counseling where employee’s highest requirement is to keep the identification confidential. This benefit may involve high investment and specified programs. The outcome of the plan however, works in the organization’s and employee’s favor. The employees may be going through a rough patch and a support right there will help them take positive decisions for themselves as opposed to some mismanaged, random, in the most moment, self destructive steps. Companies are often seen providing benefits to employees as a need. Here are the main reasons which compels companies to so. There is no denying the fact that the main reason why companies spend so much on designing benefit plans for the employees is – Motivation. Benefits are designed to increase the work efficiency and keep the employees motivated. There are perks that are offered under this umbrella which further boosts the employee’s motivation level. When employees receive perks or benefits for creating a new solution or developing an organization, they are motivated to do more and are often seen adding to a positive work culture. Employee Benefit plan can allow the organization to create a special workforce focused on achieving a specific target. For example: a particular sales for a period can be achieved by introducing a plan that would inspire the employees to work towards it. At the time of recruitment, these benefits creates a positive image of the organization that allows young and talented individuals to join the organization. They give positive edge to companies against their competitors. Organizations are also seen keeping the talent within the organizations because of the benefits plans they offer. Employee’s who feel that the organizations care for them are never seen leaving the organizations. This leads to development of strong organization who have experienced professional working for them. With various health benefits and wellness programs that are offered, organization enjoys a healthy workforce. This directly affects the absenteeism and retention of employees. With health benefits for employees also take that initiative to visit a specialist in case of problems and not procrastinate. It also ensures that proper care is given to the employees when they visit a doctor’s place. Advantages of health insurance benefit plans increase the productivity of the business. High cost of benefits plans is the most poignant disadvantage. Most companies are seen to spend around 30% of the compensation as a part of employee benefits program. This is a lot of load on the company. Even government payout ratio for certain plans is quite high. It is seen that when these plans are not fully utilized then the investment made in them becomes waste and create a burden on the company. 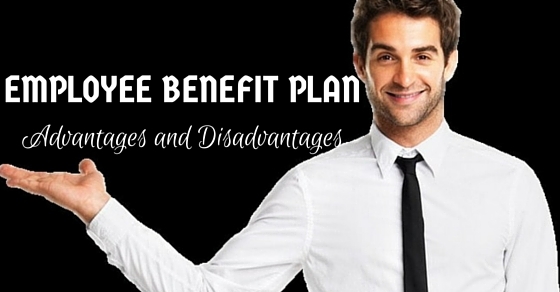 There are many benefit plans that can be offered to the employees. Mostly companies have to make an estimate of the benefits that are required by the employees and suits the demands of the states. This involves a lot of research for which companies have to bear a lot of cost. Along with this an estimation error could mean waste of energy and resources. Most organizations are not in a position to offer certain type of benefits but offer them due to industry demands which is detrimental to the organization. Employee Benefit plan is enormous and involve a high level of paper work and documentation. Also, the phase the organization is in influences the choice of benefit plans offered. If there are changes in the plans due to change in polices the process involves an extra burden and cost on the organization. A separate department and administration is needed by the organization to keep all the documentation up to date. Mostly small business fall prey to making expensive errors in benefits offered to employees. There are a few simple things that can be kept in mind to ensure that no such errors are made and that the plans offered benefits the employees and saves cost to the organization. Many a times it is seen that employers make contribution to benefits that are not even needed. This leads to a huge cost that the organization has to bear without receiving any advantages in return. A good strategy here is to involve employees in the plan. Ask for a minimal amount that needs to be contributed by the employees, this helps a lot in identifying who are the ones that really use the benefits. For example: In insurance plans, since they are provided for free the employees opt for them, a simple portion in the premium by them will make them read the offer and sign up for what they would really need. This happens when a separate team for administration is not set up. Mostly small organizations do that in order to save some money, which leads to extra cost instead. Generally, organization delegates the work to employees who wear 12 different hats. These employees due to the lack of technical skills miss out on important information. A simple example is not enrolling new employees for existing plans within the due date, that may lead to extra cost during the late hours of enrollment. Sometimes tax benefits are also missed out on when such benefits are not properly documented. Organized work here is a must, to avoid unnecessary expenditure on avoidable situations. Last, but definitely not the least, make sure that the benefits that are provided to the employees are the need. Mostly employees are seen not appreciating the benefits they receive because they do not see value in them. Analyze the need for the organization, involve the work force and then decide upon the benefits. Involving the employees would ensure that they are aware of the efforts the company has put into creating the right kind of work atmosphere for them. Look for plans which are flexible or keep them optional, but make a choice that would involve the employees in the process. Employee benefit plan is designed to provide advantages to organization and support to employees. The main catch is how well they are maintained and designed to yield better returns. Previous articleHow to Focus on Work at Home without Getting Distracted?